Hypoallergenic complete dog food. A complete dietary food designed to reduce food intolerances. Feeding correctly is essential in order to maintain health and vitality in dogs suffering from food sensitivity. Many dogs show an allergic reaction to specific ingredients or suffer from digestive issues or problems with their skin and coat. However, it is not always the individual components which are responsible but their denaturation. 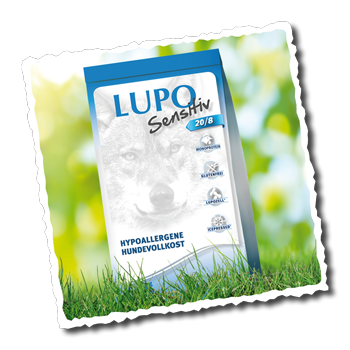 For highly sensitive dogs it is also imperative that the feed ingredients are absolutely uncontaminated as the tiniest trace of an allergen can cause a severe allergic reaction. Recommended feeding duration: 3-8 weeks after intolerance symptoms ease; can be fed indefinitely. We would recommend you obtain expert advice before feeding. Your dog’s nutritional needs depend on levels of activity and age – this is just a guide. Please store in a cool, dry place and do not use airtight containers. Tip: To measure correctly, use our practical measuring cup – available from your local supplier. Find your contact to buy our products.